London, Sir John Soane’s Museum, inv. P111. The painting was engraved in reverse by Nicolas de Larmessin, and was announced in the October 1735 issue of the Mercure de France (p. 2251). Paris, collection of Jean de Jullienne (1686-1766). The 1735 engraving indicates “du Cabinet de M.r de Jullienne.” Similarly, the announcement in the October 1735 issue of the Mercure de France telling of the availability of the print states, “Ce tableau est dans le Cabinet de M. de Julienne.” The picture was sold by Jullienne prior to 1756 and thus was not listed in the 1756 manuscript inventory of his collection, now in the Morgan Library & Museum, New York. Collection of Thomas Trevor Hampden, 2nd Viscount of Hampden (1746-1824). Sold London, Christie’s, May 31, 1799, lot 103: “Watteaux . . . The marriage, a very capital picture, engraved.” Sold for £24.3 to Sir Peter Francis Bourgeois, who was the partner of Noel Joseph Desenfans. London, collection of Noel Joseph Desenfans (1744-1807). Desenfans was a French-born, London-based art dealer who in 1790 was charged with building a collection of masterpieces for Stanislaw II August, King of Poland. However, that king’s forced abdication in 1795 and death in 1798 brought the project to an end. Desenfans’ petitions to the Russian government for payment were unsuccessful. Nonetheless, he continued to buy paintings such as this one. London, Skinner and Dyke, sale, March 16-18, 1802, “Pictures which were Purchased for his Majesty the Late King of Poland,” lot 61: “Watteaux—The Marriage—[Vide Descriptive Catalogue.] No. 62.” The description repeats the entry of 1801. The painting sold for £32½ according to an annotated copy of the catalogue in the Rijksbureau voor Kunsthistorische Documentatie. London, collection of C. Hunter (probably a dealer or agent for Sir John Soane). London, collection of Sir John Soane (1753-1837, architect). Bought from Hunter on April 26, 1802, for £42. The purchase is recorded in Soane’s day book. Paris, Jacquemart-André, Watteau à Fragonard (2014), cat. 3. Hédouin, “Watteau” (1845), cat. 125. Hédouin, Mosaïque (1856), cat. 127. Goncourt, Catalogue raisonné (1875), cat. 98. Dacier, Vuaflart, and Hérold, Jean de Jullienne et les graveurs (1921-29), 1: 123, 3: cat. 116. Réau, “Watteau” (1928), cat. 86. 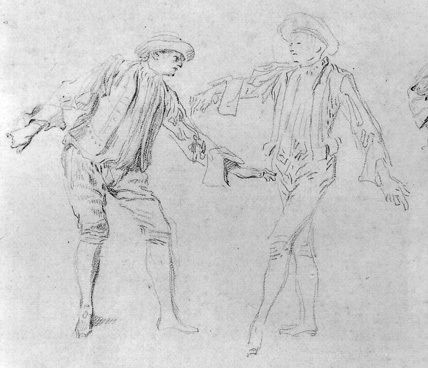 Parker, Drawings of Watteau (1931), 27-28. Adhémar, Watteau (1950), cat. 130. Mathey, Watteau, peintures réapparues (1959), 41-42, 68. Macchia and Montagni, L’opera completa di Watteau (1968), cat. 117. Ferré, Watteau (1972), 3: cat. A7. Roland Michel, Watteau (1981), cat. 117. Roland Michel, Watteau (1984), 209, 214, 223, 266. Posner, Watteau (1984), 22, 26, 38. Rosenberg and Prat, Watteau, catalogue raisonné des dessins (1996), 1: cat. 75, 77, 117, 120, 130, 135, 164, 225, 325; 2: cat. 460, 480, 482, 508; 3: cat. G55, G63, G109, G116, G118. Temperini, Watteau (2002), cat. 51. London, Royal Academy, Watteau, the Drawings (2011), 145. Vogtherr, Watteau at the Wallace Collection (2011), 33, 37-40. Given that there are more than forty figures in just the foreground of the composition as well as a handful more set in the background, it is fitting that as many as sixteen extant drawings and a number of lost drawings can be related to this picture. 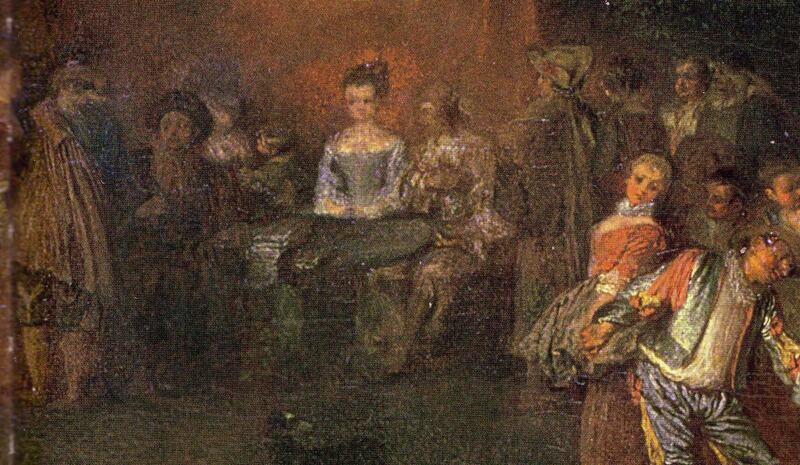 Of course, originally Watteau availed himself of more drawings for the many characters in this complex painting. 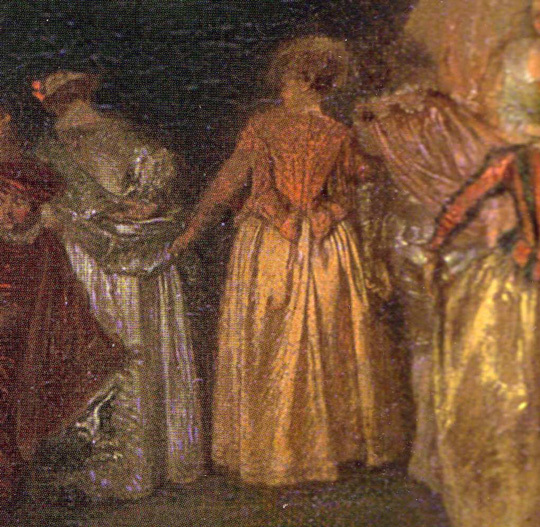 Watteau, L’Accordée de village (detail). 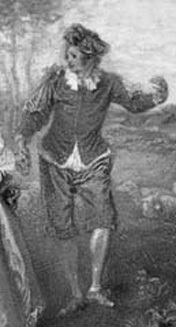 Jean Audran after Watteau, A Standing Man with a Cane, engraving, Figures de différents caractères, plate 139. Watteau, Three Studies of Children (detail), red, black and white chalk. Philadelphia, private collection. 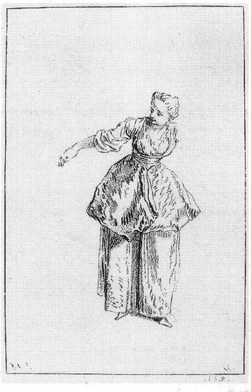 Anonymous after a Watteau, A Standing Girl, engraving, Figures de différents caractères, plate 314. 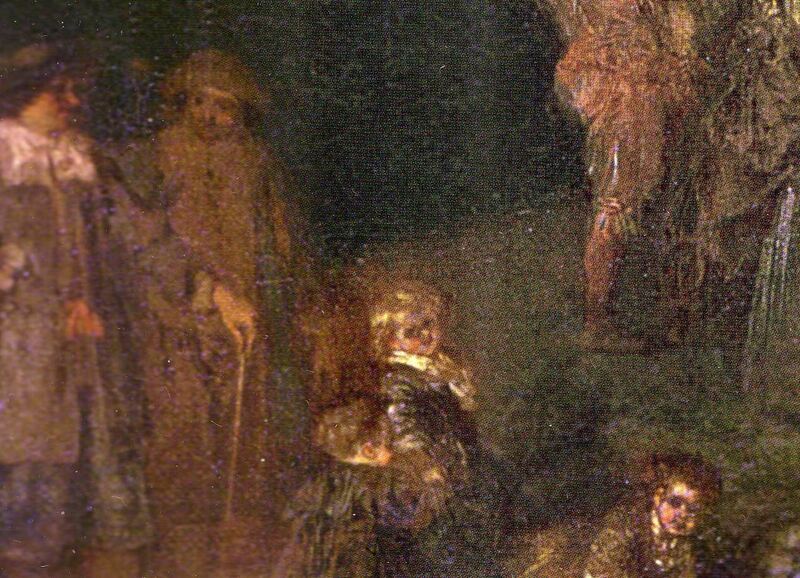 In the left corner of the paintings are two men and three children, who in 1802 were described as “Watteaux . . . with his children and his friend Rysbrack.” This claim is without basis, not only because Watteau had no children—much less three of them—but also because he had no known relationship to the sculptor John Michael Rysbrack or his son Michael. In fact, these figures are based on Watteau’s typical studies of models done in his studio. 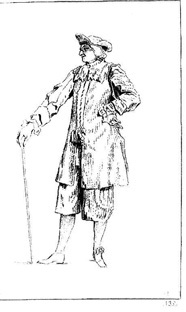 The standing man posed with a staff was derived from a no-longer extant Watteau drawing that was engraved as plate 139 in the Figures de différents caractères. 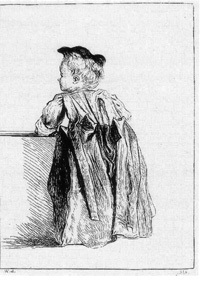 The girl standing upright, looking over her shoulder, was taken from a sheet of studies after two girls now in a Philadelphia collection (Rosenberg and Prat 508). One of her “sisters” in the painting, the girl seen from behind, was based on a drawing that has not survived but is recorded on plate 314 of the Figures de différents caractères. 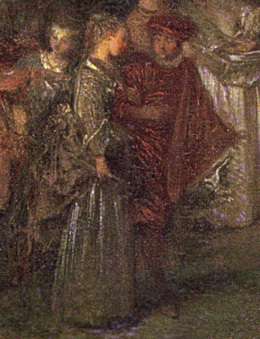 Watteau, Les Champs Élisés (detail). London, Wallace Collection. 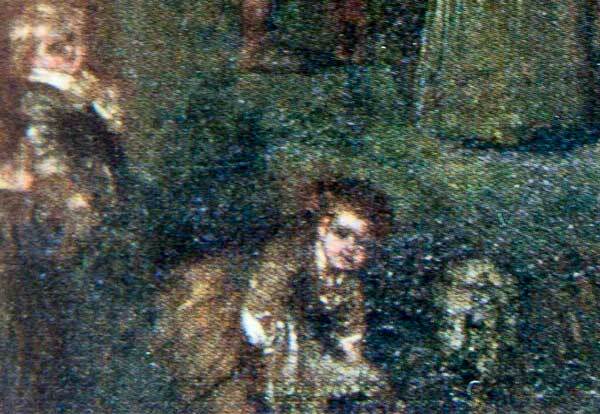 The drawing for the child sprawled on the ground has not survived but its existence is implied by Watteau’s later use of it in several paintings, such as his Les Champs Élisés in the Wallace Collection. Watteau, Three Studies of a Woman (detail), red chalk. Paris, Musée Carnavalet. Watteau, Three Studies of an Actor (detail), red and white chalk. Paris, Musée du Louvre, Département des arts graphiques. The couple entering the scene from the left was derived from two separate studies. It has escaped attention that the woman standing in profile, one hand lifting her overskirt, was derived from a sheet of studies now in the Carnavalet Museum (Rosenberg and Prat 140). The man guiding her onward was based on a rapid drawing from the model captured on a page in the Louvre (Rosenberg and Prat 480). Watteau, Three Studies of a Woman (detail), red and white chalk. Brussels, Musée des beaux-arts de Belgique. 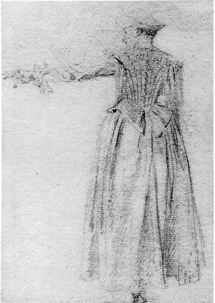 Watteau, Study of a Standing Woman, red chalk, 13 x 9.1 cm. Whereabouts unknown. 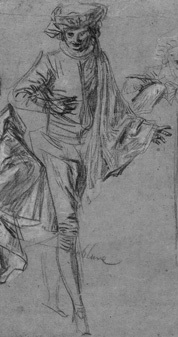 Watteau, Four Studies of an Actor (detail), red, black and white chalk. France, private collection. Farther to the right in the painting are figures seen from behind, two women and a man. The first woman would seem to be a modification of a study on a sheet in Brussels (Rosenberg and Prat 225). In the painting, the tilt of her head and the position of her right arm have been changed slightly but the elaborate folds of her diagonal sash are unmistakable. The second woman was probably taken from a drawing (Rosenberg and Prat 225) where, however, her arm is extended and the tilt of her head is different. Her male partner was taken from a sheet of four studies of a young man striking elegant poses (Rosenberg and Prat 325). 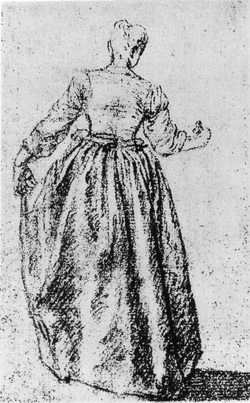 Watteau, Study of a Woman in a Dance Position, red chalk, 13 x 8 cm. Whereabouts unknown. Watteau, Le Plaisir pastoral (detail). Chantilly. Musée Condé. The couple dancing at the center of the composition is a composite created by Watteau from two separate drawings. The woman was taken line for line from an early study (Rosenberg and Prat 120). 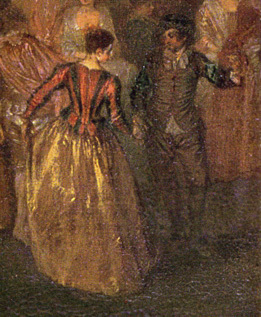 Her dance partner was evidently a drawing that has not come down to us, but Watteau used it on other occasions, as for the dancer at the center of Le Plaisir pastoral, another relatively early painting. Watteau, Four Studies of Actors (detail), red chalk. Haarlem, Tyler Museum. 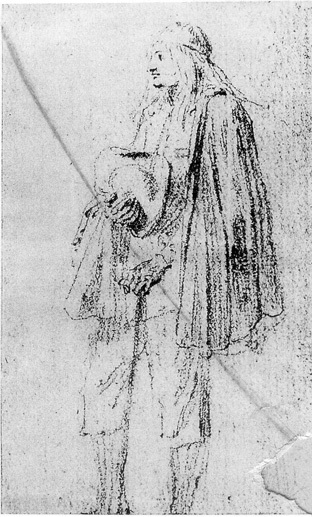 Watteau, Actor Dressed as a Notary, 13.2 x 8.6 cm. Paris, Musée du Louvre, Département des arts graphiques. Jean Audran, A Seated Actor, engraving, Figures de différents caractères, plate 317. 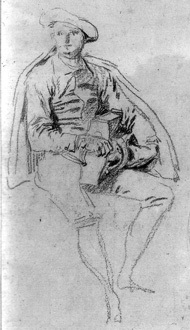 Watteau, Study of a Man Standing in Profile, red chalk, 13 x 8 cm. Whereabouts unknown. Watteau, Study of an Actor, red chalk, 13 x 8 cm. Whereabouts unknown. A number of drawings can be associated with the wedding group itself. The standing man, seen from behind and speaking to the notary, was derived from a sheet of studies in the Tyler Museum (Rosenberg and Prat 135). As shown by the other studies on this sheet, the man is a comedian, an actor distinguishable by his long hair. The seated notary, quill pen in hand, was based on a drawing now in the Louvre (Rosenberg and Prat 77). The young groom, seated at the table, his hat tucked under his arm, was taken from a drawing that was recorded on plate 317 of the Figures de différents caractères. The man to the right of the groom, seen from behind and in profile was taken from another drawing (Rosenberg and Prat 117). At the very far right of this group, the actor with long hair makes another appearance, this time holding his wide-brimmed hat in front of him. He too is based on an extant drawing (Rosenberg and Prat 75). This drawing, like the previously mentioned studies of the woman dancing, the notary, and the man standing in profile, has an almost identical format: they are sheets of the same size with single, isolated figures. The implications of this series are unclear. Were they actually drawn from live models or was Watteau copying preexisting figures from larger sheets, perhaps to prepare a set of etchings? Watteau, Three Studies of an Actor (detail), red chalk. London, British Museum. 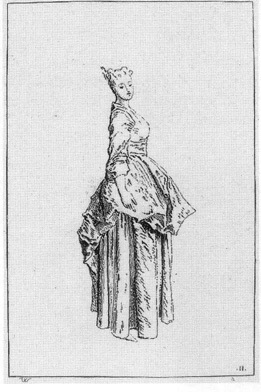 Jean Audran after Watteau, A Standing Woman, engraving, Figures de différent caractères, plate 11. 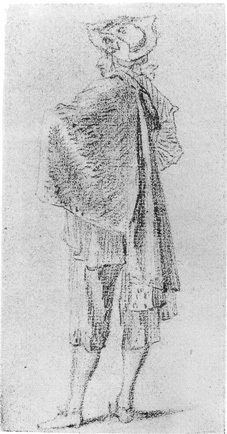 Jean Audran after Watteau, A Woman, engraving, Figures de différent caractères, plate 139. 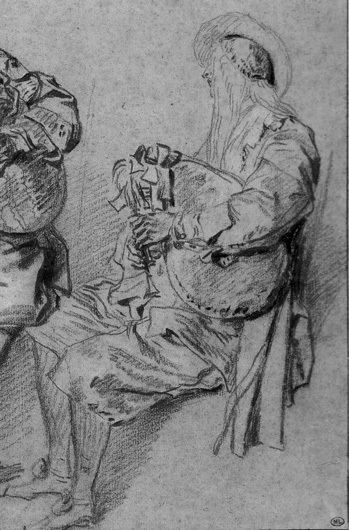 Watteau, Two Studies of a Man Playing Bagpipes (detail), red, black, and white chalk. Paris, Musée du Louvre. The bagpipe player at the far right of the composition was based on a sheet in the Louvre that contains two remarkable studies of this actor (Rosenberg and Prat 460). The drawing for the hurdy-gurdy player is no longer extant, but a closely related study appears on the previously discussed sheet now in Haarlem (Rosenberg and Prat 435). 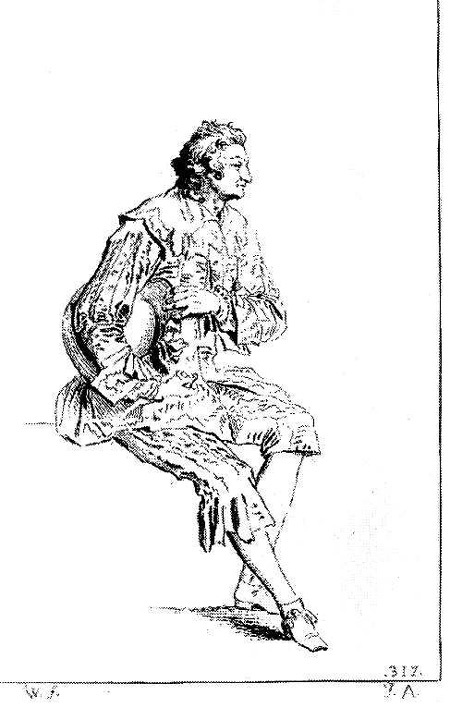 There are differences in the angle of the musical instrument and the position of the arms and the crossed feet, but nonetheless there are enough shared features to suggest that the drawing Watteau used for L’Accordée de village was taken from a closely related study of this same model. The Haarlem sheet also contains three studies of an actor, one of which was used for the man who speaks to the notary. Thus it seems likely that Watteau drew all these studies at approximately the same time and that they were adjacent to each other in his album of drawings. A word should be said about the chronology of the drawings and the implications for the dating of the painting. The majority of the drawings are fairly early, although there is no certainty when assigning specific years to them. Indeed, there is the normal scholarly disagreement. For example, whereas Roland Michel would date the drawing of the notary to the improbably early years between 1708 and 1710, Rosenberg preferred c. 1710, and Grasselli suggested c. 1713. Equally noteworthy is the fact that a number of the drawings are distinctly later, even if we cannot measure precisely the gap in years. The drawing of the bagpipe players, for example, shows a more robust drawing style, a greater amplitude of form, and a more evolved medium—Watteau’s beloved trois crayons. 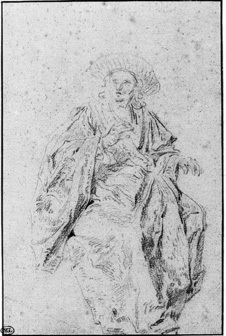 Grasselli first assigned a date of 1715-16 for this drawing and then proposed 1715. Rosenberg and Prat preferred 1716. Similarly, the sheet that contains the study of the man standing to the left of the notary has three more, closely related studies of this model. They are all rendered in trois crayons and, significantly, some were used for recognizably mature paintings: L’Indifferent and the 1717 Louvre version of L’Embarquement. Roland Michel first suggested that L'Accordée de village was painted c. 1713-14, but then proposed c. 1713-14. But she left unexplained how drawings she dated 1714-16 could have been used for the picture. Grasselli suggested that the picture was painted in two stages, first c. 1713/14 and then in 1716; see her c. 1986 letter to Michael Hall on file at the Sir John Soane’s Museum. Similarly, Rosenberg and Prat proposed that although the basic fabric of the painting is early, Watteau reworked some of the figures at a later date. 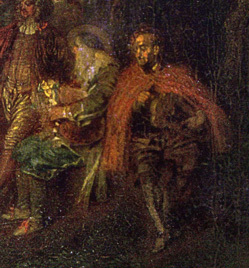 They state quite firmly that the painting can be no later than 1715, but the drawing of the man leading the woman in from the left (Rosenberg and Prat 480) must be slightly later, and others are later still. When the painting was exhibited in 2014, Vogtherr came out in favor of a date c. 1710-15. He opined that while the central group of figures represented an early phase in the painting's creation, the figures at the right and the children at the left side were later, as was the background. Mathey proposed a still later date of 1716. Until the Soane Museum painting is properly restored, it will be difficult to resolve this intriguing conundrum. Pieter Bruegel the Younger, The Wedding Celebration, 1607. Brussels, Musées Royaux des beaux-arts. David Teniers, The Wedding Celebration, 1650. St. Petersburg, The Hermitage. The subject and composition of L’Accordée de village are noteworthy because they reveal quite clearly the Northern roots of Watteau’s art. 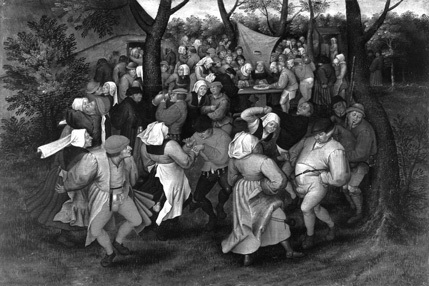 Pieter Bruegel’s famous pair of paintings, The Village Bride and The Village Dance, initiated the idea of focusing on both the nuptial contract and the town’s joy expressed through a communal dance. Bruegel's bride, sitting demurely under a canopy and crown of flowers, the notary at the side of the table, and the couple’s parents hovering over the contract are presented sardonically. So too, his depiction of the villagers’ dance to bagpipe music is a biting commentary on the hearty rudeness of peasant life. In the Wedding Celebration in Brussels, Pieter Bruegel the Younger combined the two scenes into one composition in which the bridal party occupies a central space in the middle ground, and the dancers and musicians occupy the foreground. Bruegel the Younger’s composition was evidently quite popular and today it is known through more than a hundred examples—by him, his shop, and his imitators. 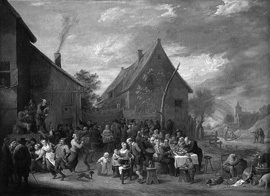 Other Flemish artists such as David Teniers contributed their variations on the theme of the peasant wedding. Here too the countless extant examples forcefully register its popularity. Moreover, the collecting of these Flemish works continued well into the eighteenth century. The comtesse de Verrue, a progressive amateur of the arts and closely related to Watteau’s circle, owned not one or two but four examples of Teniers' pictures with wedding scenes (her sale, March 27ff, 1737, lots 36, 60, 81, and 150). 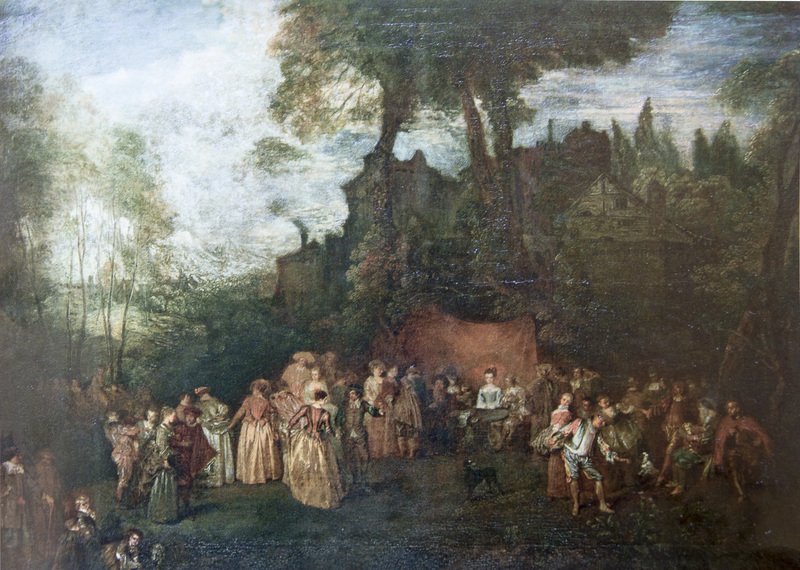 Watteau’s composition is related more directly to the one established by Pieter Bruegel the Younger, with the bridal party set back in the center of the composition, and the dancers and musicians filling the foreground. Also in Bruegel’s manner, Watteau’s composition teems with more than forty figures forming a large ensemble, each character skillfully differentiated from the others. 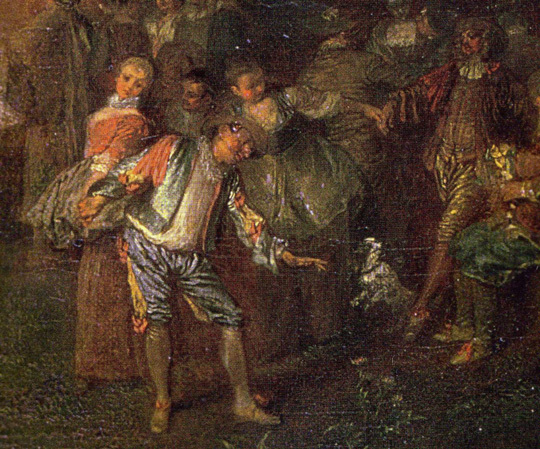 But whereas the Flemish works delight in depicting the coarseness of the participants, the stolid nature of the heavyset bride, the brawling and often drunken states of the villagers, the thumping clumsiness of the booted peasant dancers, and the rudeness of the country musicians, Watteau transformed it all into a scene of elegance. The bride and groom are young and charming, the community is urban if not courtly. The guests promenade in stately fashion and dance with grace. Much ink has been needlessly spilled on whether L’Accordée de village had a pendant and, if so, which painting that was. The announcement of the engraving in the October 1735 issue of the Mercure de France states quite specifically that L’Accordée “fait pendant à celui du même auteur, qui est dans le Cabinet de la Ctesse de Verrüe & qui représente une Mariée de village, gravé depuis quelques années par M. Nicolas Cochin.” Nothing could be more explicit. The pendant is the Mariée de village, the painting now in Berlin. They are essentially the same size (differing by only two cm in height), executed at essentially the same time, with complementary compositions that are linked thematically. For unknown reasons the pendants were soon separated. When cataloguing L’Accordée de village, Adhémar took a very curious stance: she seems to have accepted the Soane version as the primary painting but listed three others as “versions du tableau, sans doute originales.” I and most other scholars believe that the three others—the ex-Broadwood version, that from the Alfred Rothschild collection, and the one putatively from the Margrave of Bayreuth (Copies 1, 3, and 4 below)—should not be attributed to Watteau. 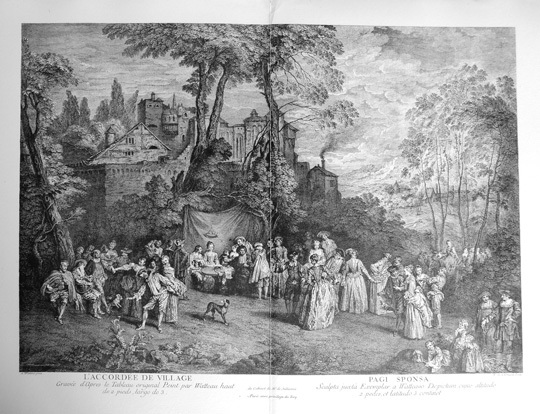 Moreover, Adhémar claimed that the Soane picture was not the one engraved by Larmessin. Rather, she proposed that the Rothschild version (Copy 1) was engraved by Larmessin. Many twentieth-century scholars, from Dacier, Vuaflart, and Hérold, to Réau, Adhémar, and Macchia and Montagni, have claimed that Desenfans left the painting to his adopted son Sir Francis Bourgeois who, in turn, bequeathed it to Dulwich College. Despite these critics, who have written that this is “the traditional and most widely accepted provenance” of the Soane Museum painting, this supposed provenance is wholly erroneous. The Watteau painting owned by Desenfans that went to Bourgeois and then was left to Dulwich is Les Plaisirs du bal. Nonetheless, the erroneous association of L’Accordée with Dulwich is long-standing. Even though de Goncourt rightly rejected the idea that it was ever at Dulwich, the error persists to our day. Macchia and Montagni, for example, repeated de Goncourt’s warning, but then they inexplicably reiterated the old claim. Nicolas de Larmessin after Watteau, L’Accordée de village (detail), reversed to the original orientation of the painting. Anonymous copy after Titian, Landscape with Buildings, bistre ink, 15 x 21.2 cm. Paris, Musée du Louvre, Département des arts graphiques. The painting's landscape is often neglected. Because of the picture’s poor condition and the general murkiness of this area, it is useful to look at the engraving to see the details of the elaborate background. As I have suggested on previous occasions, the buildings have little in common with French architectural tradition. Rather, they resemble the type of picturesque architecture seen in Venetian Renaissance drawings by Titian and Domenico Campagnola. A complex of large, rambling structures with a variety of fenestration and sloping roofs occurs frequently in these Venetian drawings. Perhaps this was what was meant in the 1801 Desenfans catalogue where it described L’Accordée de village as having “a fine landscape, executed quite in the manner of the Venetian artists.” Many examples of Watteau’s copies after these Venetian landscapes are extant but, unfortunately, neither the Venetian model nor Watteau’s copy for these specific buildings is known. Yet one can surmise they existed. L'Accordée de vilage was probably one of the first instances of Watteau employing this type of Venetian-inspired motif in his paintings. Unlike later examples, such as in his Le Lorgneur and La leçon d’amour, where the Venetian elements are small in scale and set within a vast landscape, here the buildings loom large. This parallels the situation in L’Accordée’s pendant, La Mariée de village, where Watteau used a copy after a drawing of Sant Andrea in Via Flaminia to create an equally dominant Italianate setting.